It’s that time of year again—time to pack up the school lunches! Want to avoid the lunch rut? Get the kids to help make their own school lunches with these creative lunch ideas. They will be more likely to eat (not trade) their mid-day meals. It’s that time of year again—time to pack up the school lunches. DIY Tacos: Heat leftover taco ingredients (beans, beef, shredded chicken) and place it in a kid-safe Thermos. Add separate containers of grated cheese, salsa, lettuce, rice, and tortillas or taco shells. At school, they can set up a taco bar in the cafeteria! Kids Make Their Own Sub: Pack up the fixings for a sub and let you kids assemble it at school. Include fillings such as lettuce, olives, tomatoes, and deli meats, along with a small container of mayo or olive oil and a fresh baguette or sub roll. Pita Pocket: Send your kids lunch packed with chicken or turkey salad in a container along with a wapped up piece of pita bread. At school, the kids can stuff their own Pita pockets. Food on a Stick: Food is more fun (and tastes better to kids) when it’s served on a stick. Send toothpicks in the lunchbox along with wrapped fruit, cheese and meat and let your kids make lunchtime kebabs in the school lunch room. Salad Bar in a Jar: Layer a mason jar with salad stuff, dressing on the bottom of the jar, then add layers of lettuce, grated carrot, diced meats, and tomatoes. At school, kids can shake it up and eat it right out of the jar. Puzzled over what to pack for lunch? 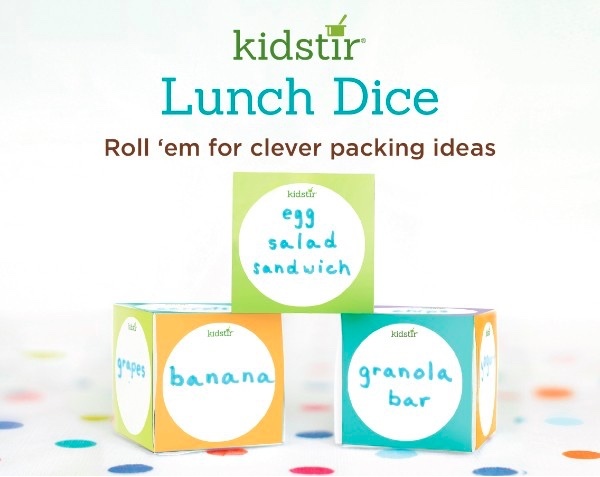 Print out our Lunch Dice, scan your kitchen for ideas, and write them down on the dice. When it’s time to get packing, roll the dice and find great ideas! Print out this page 3 times (for 3 dice). Cut along the dotted lines. Write a lunch idea in each circle (see ideas below). Die #1 Sandwiches and main courses: turkey wrap, pb&j, salad, etc. Die #3 Snacks and desserts: granola bar, cookie, pretzels, raisins. Bake the world a better place! Here’s a preview of the Bake Me Happy kit coming next month! 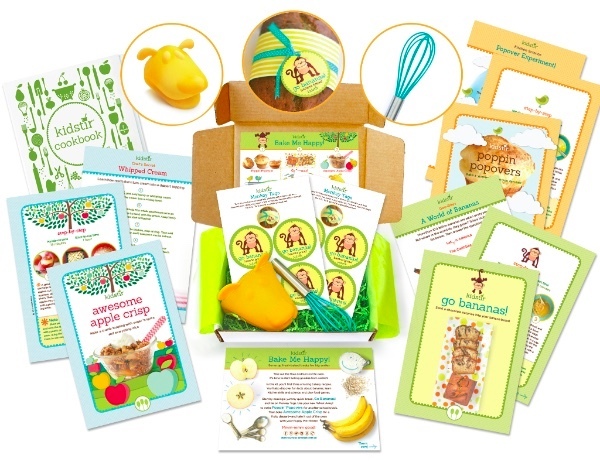 This kit has recipes for yummy baked treats, baking tools and fun baking activities. If you aren’t a subscriber yet, don’t miss this fun baking kit! 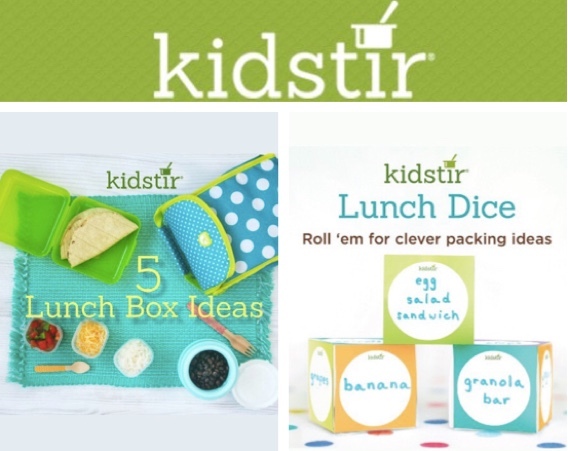 Go ahead and Join Kidstir today! Use the code BAKELOVE and get $5 off the first kit of a new subscription.